According to a study by NASA, this is one of the best air-purifying house plants. And it’s incredibly easy to care for! I love plants. I really do. It’s one of those things my peers look weirdly at me for, but it was an interest that developed sporadically and independently of my love for travel, and they just meshed together in the end. :) Now whenever I travel, I find myself paying keen attention to the flora of any given place. Plants to me have become beautiful, an art form in themselves, a symbol of life, a quiet, humble dignity that is so different from the modern world that I was thrown in. I would plant trees in my backyard if I could, if I had one, but unfortunately I live in a building, and I only have balconies and window areas to place potted plants in. Currently raising all sorts of flowering and foliage plants, a few sown from seed. 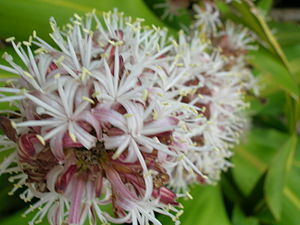 Dracaena fragrans is a common hedge plant native to Africa. It grows on stalks with foliage that resembles the corn plant, thus its common nickname of “Corn Plant”. I first bought this plant about 5 months ago because I needed something to fill an huge, vertical, empty space in the house, and it has grown considerably since. The picture at the very top was my first d. fragrans ever. I have gotten two more batches since! Important: For some very weird reason, it’s called “Fortune Plant” here in the Philippines. I remember combing through Google to find better care instructions for it but failing miserably due to the sheer number of marketers calling their plants “fortune” plants. Luckily, after a few days of searching and plant-indexing I found what it was truly called–“corn plant”. The photographed variety is of the massangeana hybrid, set apart by the light green line that runs through the middle of each leaf. The normal d. fragrans is just a solid emerald green. According to a study by NASA, this variety of the d. fragrans is one of the best air-purifying house plants ever. Amazing! It effectively removes very common indoor air pollutants such as formaldehyde (found in most household objects in the form of ureaformaldehyde resins, and cigarette smoke), trichloroethylene (a potent liver carcinogen), and benzene (from cigarette smoke, glue, paint, furniture wax, and detergents). Again, amazing, right? The Fortune Plant’s foliage grows from two nodes at the top of each stalk, resembling corn. The massangeana variety is set apart by the light green lining the middle of each leaf. The Fortune Plant is a bit masochistic in that it actually fares better underloved than overloved. No pests/diseases except sensitivity to fluoride in the water (leads to brown leaf tips). Indoors, water thoroughly ONLY about once every two weeks (“thoroughly” means, water until it drains through the bottom holes). This is to flush the soil and to make sure all parts get equally watered. I hear it also makes the roots stronger and more resourceful in trying to reach out to find water when it’s thirsty versus regular over-watering which leads to root rot which leads to, you guessed it, death. Outdoors, find a subtly shaded spot to put it in. Although I’ve never tried, I don’t think it can handle direct Philippine sunshine. It is prone to browning at the tips if it’s burned, over-watered, or completely neglected. However, when outdoors, be sure to water more often. Check the first two inches of soil. If it’s dry, time to water thoroughly. If it’s still moist, meh, leave it a few days more before watering. Water as infrequently as is necessary to just let the plant live. Why? Tap water contains flouride, which is toxic to this plant. Boiling does not remove flouride. You’ll soon end up with ugly, brown, dead leaf tips if you water more than is needed to get your Fortune Plant to survive. Flouride deposits accumulate in the soil, so it is better to water thoroughly once in a while to flush what flouride you can than to water every single day and compound the amount of flouride in the soil. If you are more loving and vigilant towards your Fortune Plant, switch to distilled water. Water stations often offer cheap distilled water by the gallon versus buying the branded ones in supermarkets. Also, since you’ll only ever water once in a while, it’s going to be pretty cost-efficient. Think about how much your Fortune Plant purifies your air for you, without needing electricity or any other maintenance, while beautifying any room, reducing your stress, and you can’t even be assed to buy distilled water for it? The Fortune Plant is best arranged in groups of three stalks or more of varying heights, in order to balance the foliage. Each stalk (the wood-like part) is a separate plant. Sellers often sell these plants bundled and arranged. The picture above shows one of my arrangements. Plants came from a vendor who seemed to just want to get rid of it as it was her last batch. She gave me seven short stalks in a single pot (about 4′ in height for the tallest and 12 inches for the smallest) for Php200. I separated the stalks into a group of 3 and a 4, put them in different pots in different rooms. One was a smoking room. It’s still alive and kicking. I have heard miracle stories of Fortune Plants suddenly flowering, and they say the fragrans in the scientific name is there because of it. The flowers reportedly have a very strong, pleasant smell that can carry past the room it’s in. However, the flowering patterns remain a mystery, and nobody knows how to induce the plant into flowering. I have heard of many stories where the plant has been with them for 5-10 years with no incidence of flowering, but one random day it suddenly flowers. The blooms last for a week or two. I’m still waiting for my moment, though, but I’ll let you know once my Fortune Plant blooms. It seems like a majestic tear-worthy experience if it really takes that long for it to bloom (but then some lucky people have plants that flower yearly)! Like any other plant, the Fortune Plant does best when placed within a reasonable reach of sunshine. My other Fortune Plant, the biggest and oldest of the bunch, receives the least sunlight out of the three that I have at home, and its leaves have gradually become a lighter shade of green. It is still alive, but I suppose it isn’t thriving, in the colors department. But in terms of size, it has been doing absolutely great. It has grown more than the others. You can propagate a Fortune Plant by cutting off a third of the top stem and removing the leaves. Remember which way is up, though, and put the cut part in a pot of well-draining soil or potting mix. Water. Sunshine. Pray. Talk to it. Play classical music. Etc. Eventually, roots will grow, and new leaf nodes will come out from the top of the stalk you cut from, and the “new” stalk you produced and planted. Arrange stalks alternately by height. Be playful with this, and try to achieve as great a balance as possible for the foliage to be even. I find that Fortune Plants don’t mind being crammed together very tightly. The roots don’t seem to be competing nor complaining, and the growth of the foliage is pretty even between each stalk. Any other travel-and-plant-loving people out there? I have a bunch of house plans as well. I have to get the low light types because it gets so hot here in the summer I have to use blackout shades in the windows in the apartment where I live. In the winter, which is actually about 6 months here I then open the blinds to let the radiant heat in. I have about 6 sansevieria plants that are next to impossible to kill and a few types of diffenbachi. I think these are both types of air purifiers. This year I re potted them in a new type of pot I found that you water from the bottom, this is supposed to be a more natural way to water plants because the water is asorped by the root systems it is in nature. My mother has one of these plants, not only did hers bloom flowers, but it also has some sort of berries growing now as well. I haven’t seen any post on the Internet of that happening to anyone else’s plant. It does happen! Congratulations on getting your plant to this stage, apparently it is quite rare (esp potted ones) and as of yet, there is no information on how to induce flowering and seed pod generation. No one knows the triggers! But they’ve been known to happen sporadically and some regularly. In my experience, some plants react to a little stress (underwatering, specifically) by bearing seed pods. I guess when the plant feels threatened, it throws all its energies into ensuring the survival of its kind, hoping the next generation fares better. Hello Shaira, Like you do I love plants but not much knowledge about it, but you know what? My fortune plants are blooming 2 days ago and the blooms only open at night, its makes me start searching and get more info about this plant and i found you ! I feel so amazed because I have not seen flowers from fortune plant. Lucky, lucky you! Congratulations! Enjoy them :) So do they smell good as the ‘fragrans’ name suggests? after 8yrs my fortune plant blooms 3rd night last night…i notice bunch of flower in the afternoon of sunday and blooms at night until now nov.13,2013..i am observing it when it will last ..so true with the fragrance . with.very nice smell…. to my 90yr old Mum is critically ill i was just there for a week and during those days she slowly miraculously recovering.My husband told me he noticed the flowers started to come out 4 days after i flew to the Philippines..I prayed so hard for miracle for my Mum..Even her doctors said its just a miracle she came back..
Our fortune plant bloomed tonight. And yes, it emits a refreshing, unique fragrance…My wife has had the plant for more than ten years, and we saw the flowers for the first time. Isn’t that heartwarming? Just the fact that a houseplant has been with you for ten years, witnessing all the happenings at the homefront in those years, and then suddenly surprising you with rare, decade blooms? Am happy for the both of you! Hello. Our Fortune Plant bloomed this week! There are 5 bunches of flowers in just one plant! AMAZING! The air is filled with its strong but sweet scent. Congratulations! Can’t wait for mine to hopefully bloom one day! My fortune plant bloomed 25 years after! My mother’s Fortune plant blooms flowers. I really enjoy the scent of Flowers in our bed room which is carried away by wind. Just found your post when I was looking up how to care for the fortune plant I just bought. It reminded me that my parents had an old fortune plant that bloomed once around 10 years ago. The scent was heavenly and the flowers opened only at night. Because of your post, I remembered I took pictures since it was such a historic, unexpected event. Even though the plant survived for many years after, it never bloomed again. We have fortune plant at home (indoor), 5 years after it gave us flowers and it smelled good–really really good fragrance that you smell soon you enter the house; friends said we were lucky because normally they don’t bloom especially with the kind of weather we have here. Now, 7 years after it bloomed again (Nov 14 2015)…feeling great! My corn plant blooms every year!! Maybe because I water it with diluted coffee?? I love it when it blooms, the smell permeates the whole house! I love my corn plant and I kept the seeds from this last flowering. I was trying to find out more about germinating the seeds but have not found anything. Thanks for your post amd I hope yours has bloomed already. I want mine to bloom as well! :-D What is diluted coffee? And what did you mean exactly by: “water it with diluted coffee”?? I have one at work and I get so many Compliments on it. Seven years later and it finally got these Flowers that smell highly of Fragrance. People even offer to buy it, usually also ask what kind it is. Very Poular. Thanks for this info, now I have to transfer my fortune plants to shaded area. So amazed because last night almost all of our fortune plants have flowers, counted 14 flowers all in all. In fact 1 stalk even has 3 flowers. We didn’t notice the flowers during the day but in the evening there was a strong pleasant smell so we looked where the smell was coming from & found that it was from the fortune plants. They are 5 years old.